Broward County is one of our most heavily urbanized areas. Yet it is home to nearly a dozen native plant communities, as shown on this close-up view of the Plant Communities Map. The light blue swath is Everglades. The best example of native coastal landscaping can be found in Hugh Taylor Birch State Park. In Fern Forest, Broward County Parks, a remnant wetland forest can be seen – just a fraction of what was once one of the richest ecosystems in Southeast Florida – a river running through huge Bald Cypress and a forest of tropical trees covered in orchids, bromeliads and ferns. 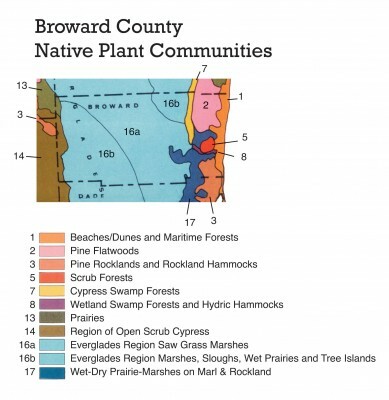 The plant communities map referred to throughout this website is used to illustrate the natural diversity of Florida and to show where in the state certain native plant communities occur. The map shows what Real Florida was, and in some places, continues to be. It is necessarily a “broad brush” treatment, and cannot reflect the detailed reality of any particular place on the ground. But by looking at the map, you can see the most common native plant communities in your county – or at least what they were before the mass urbanization of the last 50 years. The map is a starting place for you to understand the authentic landscape where you live and what natural models can serve to inform your landscape design. FANN encourages you to explore natural areas in your community to see native plants in their natural setting and associations. National and state parks, and some county parks intended for conservation, are great examples. Florida Native Plant Society Chapters throughout the state conduct guided field trips that are excellent opportunities to see and learn about Florida’s natural flora. PlantRealFlorida.org can help you locate plants found in your local historical plant communities and the resources you need to create healthy plant communities (on a small scale) in your landscape. Perhaps you cannot create a full-scale ecosystem in the typical home landscape, but you can put back a little bit of Real Florida in your yard and achieve a unique aesthetic, draw in birds and butterflies, and achieve many, if not all, of the self-sustaining performance advantages of a native landscape. The map shown on this website is directly adapted from the original “General Map of Natural Vegetation of Florida” developed by John Henry Davis, University of Florida (UF), and published in 1967 by UF’s Agricultural Experiment Station, Institute of Food and Agricultural Sciences (IFAS), in Gainesville, in their Circular S-178. The map was subsequently used for Florida ecology classes at UF for many years. Graduates from the 1960s, 70s and 80s may recognize the map. Digital reproductions are available from the University of Florida Digital Collections Library. In 1991, FANN (then AFNN) published the Xeric Guide to Landscaping with Florida Native Plants, a book that promotes the use of the map’s natural communities as a guide to water and energy efficient landscaping. In developing the book, we modified the plant community names and provided plant lists and descriptions for each community, including information on soils, drainage and other details needed for successful planting. In 2010, we added horticultural hardiness zones (8a through 11) to distinguish areas of the state, drawn according to grower experience with extreme minimum temperatures and duration of cold weather. John Henry Davis (1901-1978?) was a prominent Florida botanist perhaps best known for his groundbreaking study of Florida’s mangroves and mangrove swamp systems, mapping the Florida Everglades, early promotion of the importance of beach dunes and their development and maintenance and consultation to the infamous and fortunately ill-fated Cross Florida Barge Canal. Davis went to high school in Eustis, Florida, spent his college summers here, married a woman from Orlando, and after earning a Ph.D. in Ecology at the University of Chicago (part of an early class in this subject), returned to Florida permanently in 1941. His work with the Florida Geological Survey and UF took him all over the state, and thankfully for us, resulted in a greater understanding of our state’s native plant communities.